In this modern era, text animation is a preferred way to highlight the text/contents of a website. In fact, the animations increase the user’s attention span while interacting with your website’s contents. So, for this having a good and light weighted text animation plugin is pretty important. Now, it may seem tricky but there are plugins which help you in adding the animations to your webpage without any hassles. That’s why, in this article, we’ve rounded up 5 top rated jQuery Text Animation Plugins which will assist you to produce some spectacular animations on your website and provides the user’s interactive experience. These plugins are tiny, easy in handle, lightweight and support a various form of animations. Plus, you can save a lot of time by using these powerful plugins instead of fighting with messy codes to fix the angle of animation designs and shape of your text. Previously we use a various graphics editor to add some effects on a website but now plugins will give you all the required in-built data for putting animation or other effects on your site easily. All these plugins in this post are clean coded and well documented so you need only to download these tools and implement on your site and use just the way you want! So, without any further delay, let’s talk more about these plugins below in a depth. NuvuType is a lightweight jQuery text animation plugin which iterates through a set of text elements and then animates the text of your website. The plugin animates the text of your website easily, you just need to include a couple of code on your web page and animate any text of your site. You can set text’s speed, delay timing, color choices and font size to create a completely unique experience for your users. This plugin takes all the contents of your website and splits them at the white spaces then print those texts by using lots of animation effects. The plugin provides NuvuType Options Tester to test out all the options of animations for your text. It provides a trigger element or auto load text option when the pages start loading on your website. You can grow or shrink the animated texts to any size according to your need. It comes with four different customizable color options. NuvuType is a premium text animation plugin that will cost you $6 only which definitely comes under your budget. By getting this plugin you will also get free updates, the live team supports along with the above features. jQuery Text Animation is a jQuery plugin which provides smooth transitions effects between the text blocks. It can be used to stylize titles, menu buttons, or any other text. It comes with various undefined attributes such as a sinusoid which is a sine wave and one of the building blocks of audio signals. It also provides random explosion and implosion, different types of animation effects and various more. Plus, you will also get a preview option to test all the effects before applying them to your website. This plugin supports multiline such as twitching (to create stylistic video effects), mouseover_escape (to provide stylish contents) and more. It provides callback functions to call another function after the effect of the animation is finished. 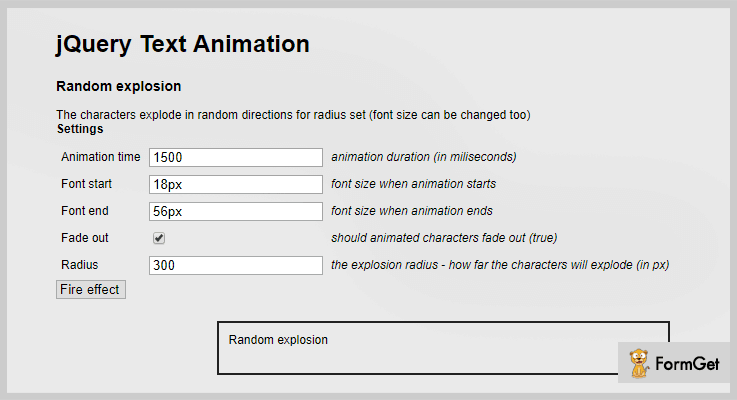 Text animation plugin provides you a shuffle option to show your animated texts in a randomized order. It allows you to set animation time for your text, their font sizes, radius etc. You can get all the features and functionalities of above listed at $6 only with its 6 months support. Marquee is a simple, high-performance and cross-browser jQuery animation plugin for text phrases powered by Fusiondevs.com. It enables you to create amazing animated marquees by using jQuery.easing frameworks. The plugin animates the texts/images and allows the designer to customize the marquee without any limitations. You can also insert various links of animations to your text area. It allows you to select animation direction i.e. from left to right or right to left to display the texts on a website. You can set timing on every text stays on the screen. It supports text, images, background, and various CSS styling option. Option to set the height and width of your animated texts. You can purchase this plugin at $5 only for its advanced features and functionalities and later extends its further services at $25 for 12-months. 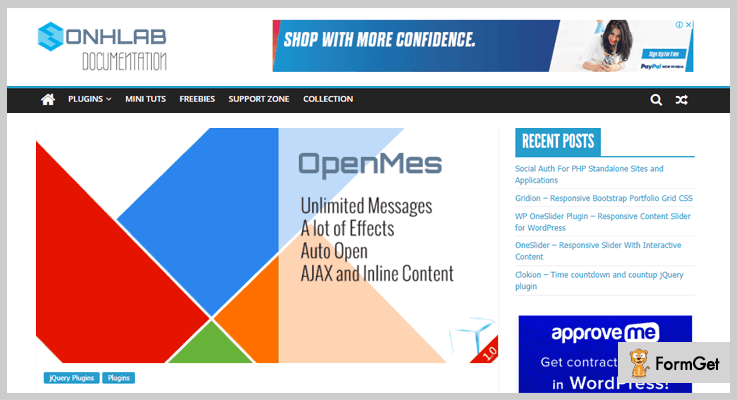 OpenMes is a jQuery plugin which enables you to create unlimited popups, lightbox, notifications on your website with the help of various animation effects. It supports text, images/videos and HTML code for creating these animated popups on your site. Additionally, this plugin also combines various inline contents and AJAX content for the best SEO result and performance. With this plugin, you can create message section anywhere on your site. It supports AJAX contents with a static and dynamic method. Ability to open multi messages on the same page of your site. Get this plugin at $9 with its unlimited features and later you can extend its services at $45 only for 12 months support. AnimatedText.js is a free jQuery plugin which provides awesome animation libraries. It provides easiness to apply jQuery animations on any text of your site. Simply include animatetext.js and it’s dependencies in your project to start creating unique effects. It provides a flipping effect on the header section when you will implement this tool on your site. The plugin comes with various animation effects for your text. It provides an option to change the position of animated content anytime. AnimatedText.js accepts 3 parameters: textObject, options, and animations. This product will cost you nothing. Means you can download it from GitHub’s official website at free of cost for a lifetime. So, these were the 5 most rated jQuery text animation plugins which we’ve specifically selected for you. All the listed items in this article are fully customizable and provide an interactive experience. 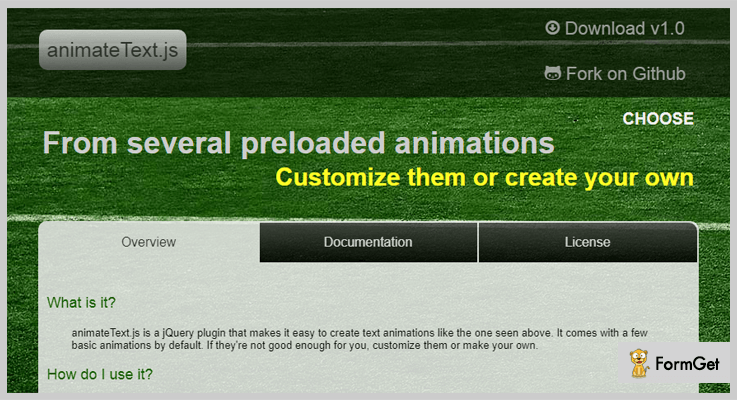 Hope that you have found the Best jQuery Text Animation plugins that meets your needs and requirements. So, if you have any suggestions regarding this blog do comment us below. We’d love to hear your feedback.